The Krumkake (Krum kaka) is a traditional Scandinavian dessert cookie with a very delicate taste. Freshly out of the iron, it is hot and soft, and easy to roll into a cone. It quickly cools, and hardens into a crisp membrane that is filled with fruit, ice cream, chocolate and other sweets. The wedding cake shown below was made with traditional and chocolate krumkakes (-Heidi Swartz). The krumkake iron produces wafers thin enough for pressing and baking “ostie” (hosts, or edible wafer paper rounds), however too thin for baking pizzelle (they would crumble too easily). Each of the other ingredients should individually weigh the same as the total weight of the eggs. Heat Krumkake iron, un-greased, until a drop of water sputters when sprinkled on its surface. Butter iron slightly for the first two cakes. Place a generous tablespoon of batter in the middle of the iron and close. Bake over medium heat until golden. 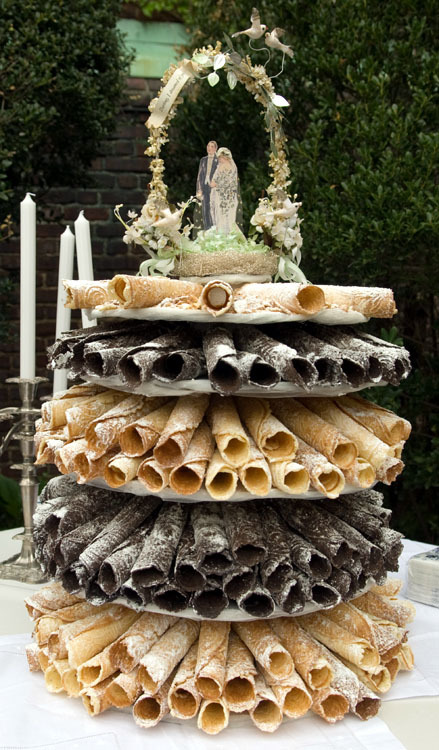 Remove cake with a fork and immediately roll up into a cone or cylinder shape over handle of wooden spoon, or with a shaping cone, or cannoli form. 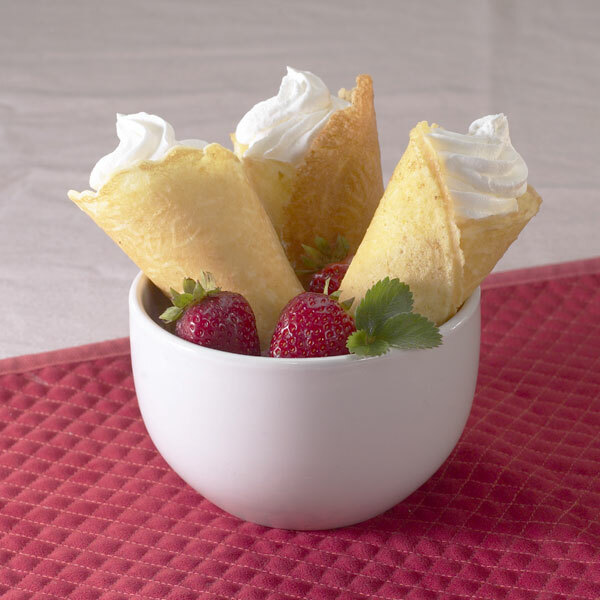 Or shape in a small bowl and serve as dessert filled with whipped cream and fruit of your choice. Beat eggs, add sugar, cream (whipped) and nutmeg. Add enough flour to handle easily, testing on hot iron. Place one teaspoonful of dough on iron and bake until a very light brown. Watch krumkake carefully, as they bake quickly. 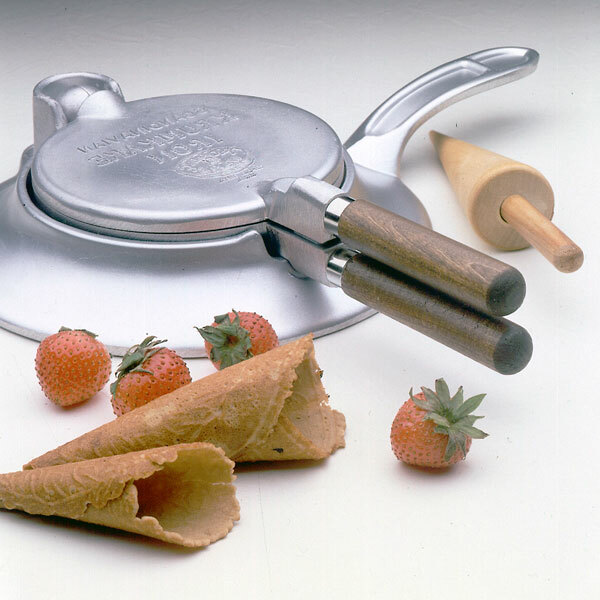 Roll quickly on stick, or press into patty shell which can be used for ice cream or fruit. Whip cream until stiff, stir in sugar, beaten egg, lemon extract and flour. Heat iron and grease. During cooking, turn the iron so that cakes will brown evenly on both sides. Immediately after removing from the iron, form the cake on a wooden cone or stick.